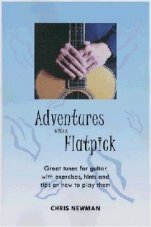 In 2001 Old Bridge Music published Adventures with a Flatpick. Included are lots of exercises that he's been showing students for many years - exercises that are simple to remember but somewhat harder to do. It's worth pursuing though as better technique will make you a better player. One of these exercises is available in Acrobat format by clicking on the link. Enjoy it! Having practised the exercise, and got your fingers doing what you want them to do, you might like to have a stab at a new tune. From here you can download one of the tunes, The Spey in Spate, in the book - arranged for two guitars. Have fun!